The name really says it all. Love the Hungry does just that by sending nutrient-rich meals to malnourished children all over the world. LOUISVILLE (WHAS11) -- The Mayor's Give A Day Week of Service started eight years ago. Love The Hungry followed closely behind, launching in 2012. It's a local nonprofit, but its goodwill is now all over the globe. Friday, the group celebrated a major milestone. The name really says it all. Love the Hungry does just that by sending nutrient-rich meals to malnourished children all over the world. It's partnered with the Mayor's Give A Day Week of Service since it started, and packaged hundreds of thousands of meals thanks to that collaboration. 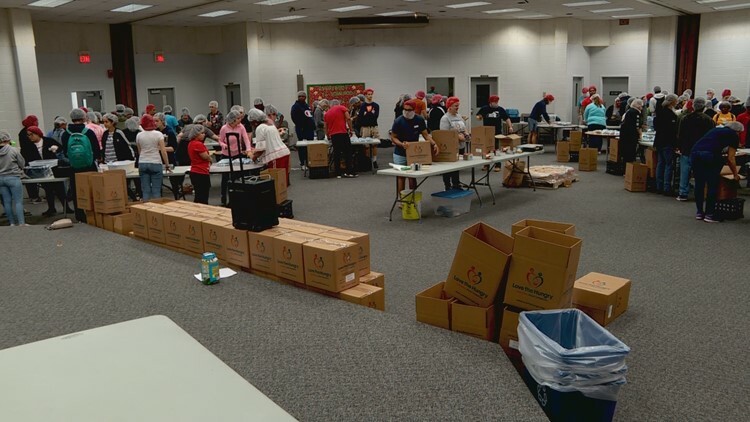 Friday morning, the group packed its 500,000th meal as part of the Mayor’s Give A Day Week of Service. Every time a box is filled, the group packing it rings a bell. That sound rang out loud and clear at Fairdale High School. Hundreds of students volunteered Friday. "Our meals have been distributed to more than 20 countries outside the United States,” Love The Hungry Executive Director Dale Oelker said. "In total, we've had over 35,000 volunteers that have been part of our packaging sessions. They've produced over six million meals. Our tagline is local action where we engage volunteers of all ages locally, global compassion where the impact reaches countries throughout the world. There is a special packet of micronutrients that have high concentrations of the vitamins and minerals that we know are lacking in the diets of hungry children. Then, we add a blend of vegetables. There's a soy protein or vegetable protein and rice that make up the ingredients to the Nutri-Plenty Meal." The nonprofit added about 15,000 more to that supply thanks to the students at Fairdale. "Fairdale is a globally-minded school, and we have kids that are full of compassion and willing to sacrifice and give back as you can see,” Fairdale High School Student Support Services & Homeschool Coordinator Stephanie Corus said. "We have gathered together students from every grade and every walk of life in our school. Very few of the students know each other, so it's beautiful because it gives them a chance to build community across grades and across social groups. Packing meals they made possible. We've raised $4,000 to be able to pay for all of the rice, all of the vegetables, all of the nutrients, all of the packaging, and the shipping so that this project can happen." "To see the joy on their face when they know they're getting a meal that's going to be life-changing for them, that's pretty satisfying and very rewarding,” Oelker said. "We will notice a difference in their health in as short as ten days to a couple of weeks." Friday morning’s success is all thanks to a connection that comes from compassion. "Give A Day has been a great way to link with groups in the community that may not have heard about us otherwise,” Oelker said. Love The Hungry is getting ready to send a big shipment to Haiti and Guatemala. The meals usually go out within a few months of packing them, but they can stay good for up to three years. Click here to get involved.